How is it possible that I haven't yet blogged about homemade chicken broth? This magical stuff is the secret ingredient to a perfect bowl of soup noodles. I'm not sure who started the myth that chicken broth is hard to make, but I suspect it was someone in the canned broth industry. Sure, I'll reach for store-bought broth if I'm making a super-flavorful dish like black beans or jambalaya, because the heavy spicing totally obscures the flavor of the broth. 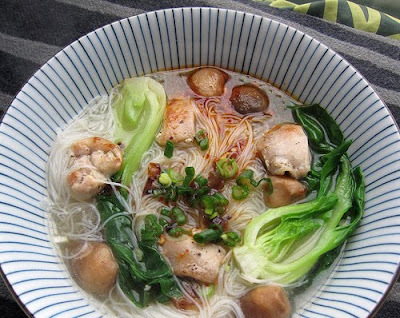 But in a dish like soup noodles, where you're pretty much drinking the broth straight, you have to go homemade or go home. First, let's banish the idea that making your own broth is difficult. It only takes one pot, a handful of common ingredients and about an hour, most of that unattended. In return, you get about five to six liters of broth, enough for at least ten bowls of noodles. Plus, if you buy your chickens whole, remove the meat, and freeze the carcasses, making your own broth is practically free. That's right. I just said free soup noodles!! I may as well be telling you the secret to making free crack cocaine, because that is pretty much how I feel about soup noodles. I can't wait to see the Google traffic I get from that last sentence. Now, in a perfect world, you already have some frozen chicken bones saved up for this project. Otherwise, you'll need to buy bones from a butcher, or buy a whole chicken and find some other use for the meat, for example, chicken biryani. 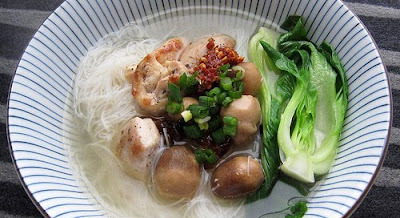 You can also use some of the meat in your soup noodles, as I'll describe below. Either way, you need the bones from a couple of chickens. Because chicken broth is so easy to freeze (and useful in just about any recipe, from risotto to gumbo to gravy, not to mention those bowls and bowls of soup noodles I go through in any given week), I always make as much as possible in one go. 1. Place chicken bones in a large stockpot. Cover (barely) with water. As my mom always says "don't get greedy." Add onions and ginger and bring to a boil. As soon as bubbles appear, turn the heat down to medium-low and skim off any scum that appears. The easiest way to do this is with a cheapy scum skimmer that you can pick up for about $2 in an Asian market. I got mine at Kamei (a restaurant supply store) and use it at least once a week, giving it easily the best ROI of any single item in my kitchen. 2. Add rice wine (if using) and simmer, covered, for about an hour. Strain out bones, ginger, and green onion. Salt to taste. The resulting broth should taste clean, bright, and almost sweet. At this point, you can use the broth. If freezing, allow broth to cool (never place hot/warm items in your freezer), place in airtight containers—allowing a bit of room for expansion—and freeze for up to three months. Seeing as just about every other recipe on earth calls for chicken broth, I don't think you'll have any problems finding uses for your new ingredient. Here's how 99% of the chicken broth in my house gets used. 1. If the chicken broth is frozen, you will need to move it into the refrigerator two nights before using to give it time to defrost. Heat 1½ cups of defrosted broth in a small saucepan over medium heat. If chicken broth is freshly made, you can obviously use it straight from the stockpot. 2. Cut chicken into bite-sized pieces and marinate for a few minutes in the soy sauce, sesame oil, and black pepper. 3. Start a large pot of water boiling. 4. In a small frying pan, cook the chicken for a few minutes, stirring so it gets evenly cooked. After about four minutes, add the mushrooms. Saute for another minute. Remove from heat. 5. Add noodles to the pot of boiling water and cook according to package instructions. Rice vermicelli only takes about a minute to cook. Place vegetables in the water and blanch briefly (30-45 seconds). No matter which noodles you're using, don't add the vegetables until the very end of the noodles' cooking time. The veggies really only need a quick dip in the boiling water to cook. 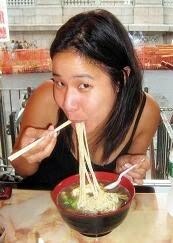 Place a bundle of noodles in the bottom of your bowl. Top with chicken-mushroom mixture and blanched vegetables. Ladle broth on top. Serve with sliced scallions, homemade chili oil, and fried shallots. So simple, but it looks so good! Yowza. That looks *amazing*. Has mom tried your chicken noodle soup yet? This sounds delicious and so heart-warming. It sounds easy enough to make for a weeknight dinner, can't wait to give it a try!